Bullying is an aggressive behaviour that can occur both physically and psychologically. Bullying is experienced repeatedly over time and involves a bully (the aggressor) and a victim. Over the past decade, there has been an increasing focus on addressing bullying. The primary places where the attention of addressing bullying is amongst peer groups in schools and workplaces. Bullying has a significant long-term effect on victims which can create a harmful effect on physical and mental well being for the individual due to the exposure to ongoing stress. Historically, bullying occurred in person, however, in a modern age, cyber-bullying is increasing and can be perpetrated by known individuals to the victims or by unknown or anonymous people using the internet. In these circumstances, it’s often difficult to identify your bully. Cyber-bullying also means the bullying experience extends beyond school or work and continues on while the victim is in their own safe space at home. With cyber-bullying, we have the ability to remove ourselves from the digital social world. For teenagers, this can be more difficult as social media is used to develop peer relationships. If all of your friends are on social media organizing social events and interacting with each other, this can create exclusion among peer groups if one member chooses to remove themselves from social media due to bullies. Cyber-bullying can also be delivered through text messages and emails and it can be impractical for people to continuously change their phone number and email addresses. Experiencing bullying and confrontation with others is an experience many face in life at various ages, therefore it is important that we develop life skills to help us cope emotionally as well as develop strategies for dealing with aggressive people. Victims of bullying are continuously exposed to a power imbalance with the person who is attacking them either verbally or physically. Bullying is used to demean and belittle people and this can have a significant impact on a person’s self-esteem over time. By developing emotional coping skills and response strategies to the bully, this can help an individual rebuild or maintain a higher level of self-esteem. By developing these necessary life skills, this can help the individual cope with confrontational experiences that occur throughout life over all stages of development. One of the most useful aspects of art therapy for helping people who experience bullying is providing an outlet for emotional expression without the need for verbal expression. As bullying occurs frequently in younger populations, this is helpful for young people who may not have developed the verbal communication skills that enable them to engage in talk therapy. Art therapy can help with emotional expression through art. Art therapy can also provide a space for role-playing that can help clients develop skills that empower them to interact with people exhibiting aggressive behaviours. Art therapy can also help repair damage to self- esteem that may occur as a result of repeated exposure to demeaning language and behaviour from perpetrators of bullying. Through art therapy clients can learn to validate their emotions and develop confidence in their ability to problem solve difficult situations by exploring possible outcomes through art. Art therapy can help clients understand the dynamics of bullying by understanding the power imbalance. Bullying can be very damaging for young people as they have not yet developed coping skills through life experience to deal with difficult situations or emotions. Bullying for young people may be the first time they have experienced stress or a traumatic experience in their life, and this can have significant impact on how their personality continues to develop. Art therapy can be effectively used for victims of bullying and it can also be helpful for those who perpetrate bulling. Often bully’s have experienced bullying themselves and bully others as way of dealing with their own insecurities. When dealing with younger clients it is important to remember that the bullying experience may be the first time this person has been experienced these negative emotions and therefore may need you to validate their ability to express and understand emotions through art activities. A large part of the bullying experience is to send a message to the victim that they don’t matter. Therapy is an important part of breaking this belief down so that the individual can start engaging in emotional expression of their fears and worries. Summary of sessions to date: James was bought to an art therapist by his parents as his behaviour and school work has begun to change. 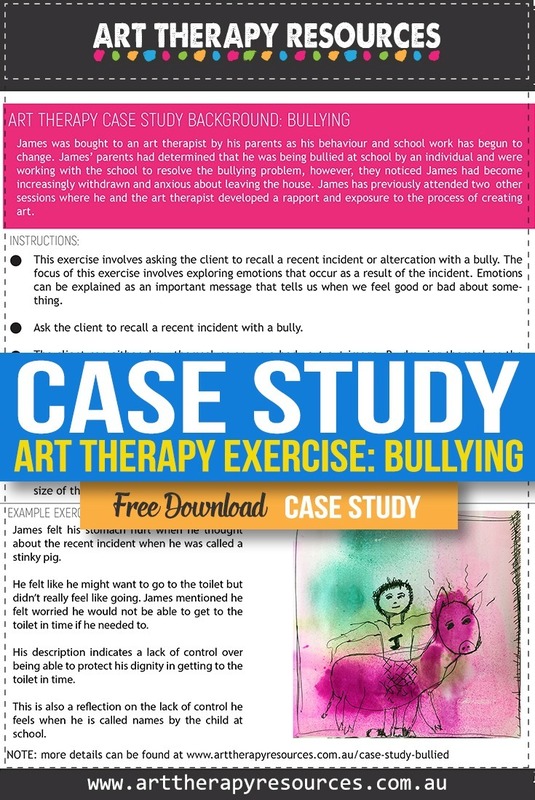 James’ parents had determined that he was being bullied at school by an individual and were working with the school to resolve the bullying problem, however, they noticed James had become increasingly withdrawn and anxious about leaving the house. James has previously attended two other sessions where he and the art therapist developed a rapport and exposure to the process of creating art. 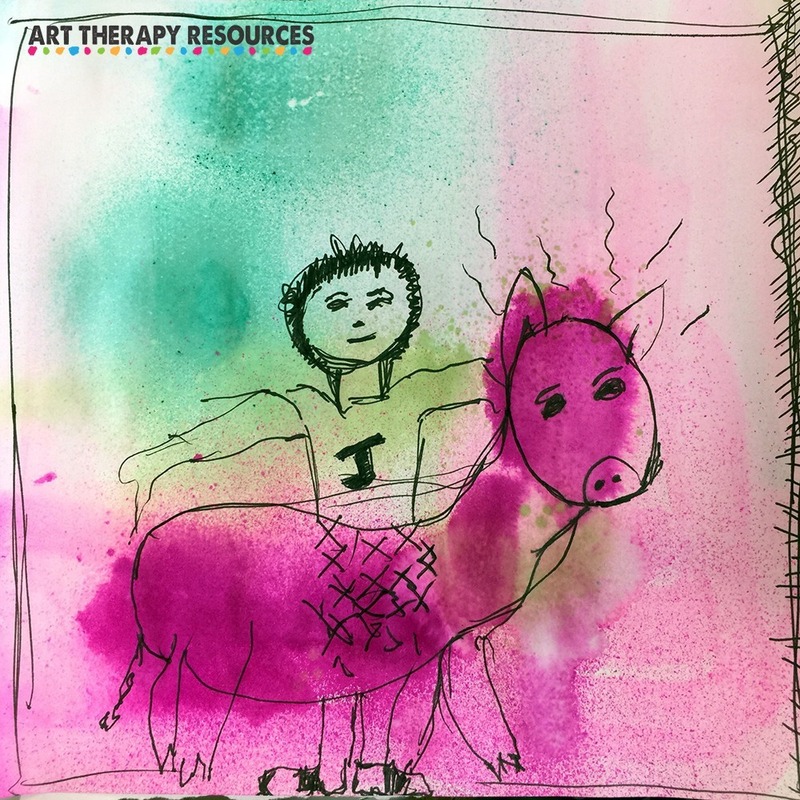 In this session, the art therapist will work with James to recognise his feelings of anxiety. This includes feelings of anxiety in his body. This will help James learn what anxiety is and assist him in identifying its presence when he is feeling bad. 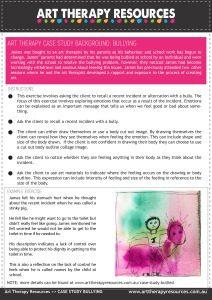 James and the art therapist discussed a recent event where another child at James’ school called him a ‘stinky pig’ as he looked sweaty after a sporting event. This other child frequently called James names based on different activities the class would undertake. This exercise involves asking the client to recall a recent incident or altercation with a bully. The focus of this exercise involves exploring emotions that occur as a result of the incident. Emotions can be explained as an important message that tells us when we feel good or bad about something. Ask the client to recall a recent incident with a bully. The client can either draw themselves or use a body cut out image. By drawing themselves the client can reveal how they see themselves when feeling the emotion. This can include shape and size of the body drawn. If the client is not confident in drawing their body they can choose to use a cut out body outline collage image. Ask the client to notice whether they are feeling anything in their body as they think about the incident. Ask the client to use art materials to indicate where the feeling occurs on the drawing or body outline. This expression can include intensity of feeling and size of the feeling in reference to the size of the body. James felt his stomach hurt when he thought about the recent incident when he was called a stinky pig. He felt like he might want to go to the toilet but didn’t really feel like going. James mentioned he felt worried he would not be able to get to the toilet in time if he needed to. His description indicates a lack of control over being able to protect his dignity in getting to the toilet in time. This is also a reflection on the lack of control he feels when he is called names by the child at school.